Obviously each team would try to adapt it to their design philosophy; long wheelbase, short wheelbase, wedged stance etc. It really does look the business. Assuming that is allowed???? This is where the main area of disagreement is going to lie. Stock chassis and stock engine or individual team designed chassis and engine. Stock chassis and engine would align F1 to F2 and the technical battle at the constructors level would disappear, but is that what F1 is about? I suppose some may argue that, if Haas can buy technology and storm to the sharp end of the midfield, there is some precedent for stock chassis. But that is only one team doing this, every other team is designing and building their own components using whatever technical knowhow they have available. Sometimes they get it right, like Force India and Sauber; and sometimes they get it very wrong like Williams and Mclaren. You might argue that inability to get it right is no reason to change the formula but this is only fair if everyone is using the same level of resources. By this l mean same budget and same number of people etc. The calibre of the people available to each team should be the differentiating factor not the budget. Can Mercedes, Ferrari or Redbull beat Force India on track using Force India's budget and the same number of staff? Last edited by Nitrodaze; 19th September 2018 at 22:07. Looks nice, but essentially what they did was to bend every key component to have a curvy edge. This looks nice and refreshing, but will get boring eventually, just like the opposite would. Obviously each team would try to adapt it to their design philosophy; long wheelbase, short wheelbase, wedged stance etc. I really does look the business. I think the aim of this is to have the following car retain 80% of it's downforce . If this design does that , then it truly is beautiful . If it does better than that , it will be gorgeous . Right now it's just a nice thought . I think it's an improvement over the current generation of cars, but I'd rather they did without the winglets on the sides of the car, which frankly look ridiculous to me. Still I understand that they're important to help distribute airflow, so I don't think that we're going to see them go. Someone over on another forum noticed something, the logo on the nose is the old F1 logo - so looks like these may not new designs. In saying that, though, I do like the styling - however I think closed cockpit was a consideration in the overall design theme. Alexander Boris de Pfeffel Johnson - "Ping Pong is coming home"
These pictures must be translated into rules and than the rules into real cars. The cars will never look like this. I have no idea what's the point of these drawings. My only hope is that the result won't be something really horrible like de p**is noses. I do have more faith in Brawn, than the previous gaggle of geese, to look ahead for unintended consequences when putting a new sheet of design paper on the table. I don't mind the way the cars looks now (even with the dreaded PC bar latched on top). I'm glad that they went with a wider chassis, tires and wider & lower rear wing, etc. - all good things visually, IMO. But I think this concept is definitely better than the current one. 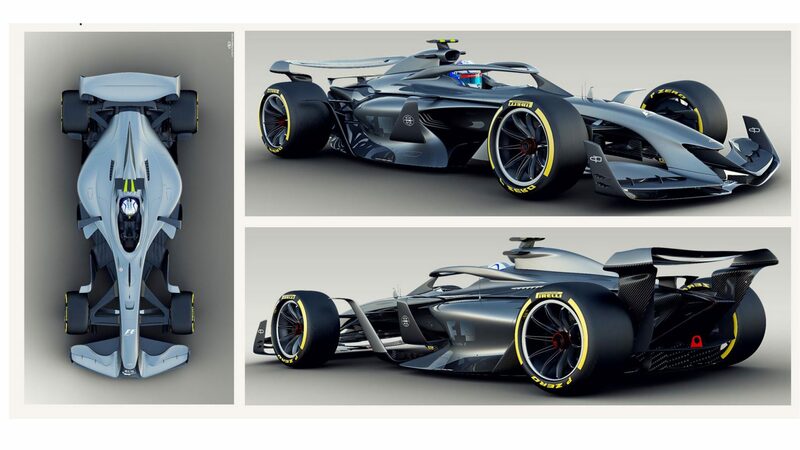 While I've seen many comments in other places criticizing the concept as being Formula Eish, I think that's fine, because the Formula E cars are pretty snazzy to my eye. This design concept is quite futuristic looking and I think it better incorporates the Halo. I also like the move to 18 in. wheels. Overall, me likey. Now if they'll just do something with the engines so that they're offensive to the ears again.